This semester, I mostly learned how to be an effective reader. I’m dyslexic, so I try to avoid reading at all costs. 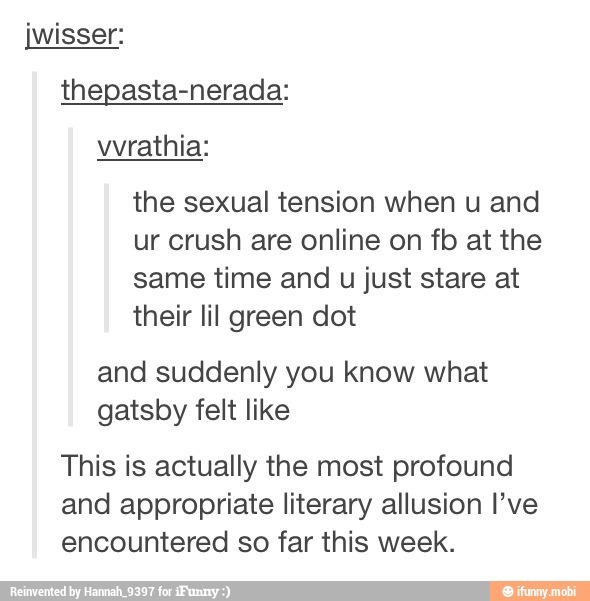 Even when I do read, I hardly ever understand what it is that I just read. Having this class and discussing exactly what we read over right after we read really helped me to learn exactly what points one should focus on while reading. This skill, though it may seem minor, has actually helped me understand my textbooks in other classes as well. By reading with the goal of being able to talk about the section afterwards, I have been able to read almost like I’m having a conversation with the book – a skill that is definitely helping me study for my finals! I didn’t really set any goals for myself this semester other than to pass all of my classes. However, being able to effectively read has definitely aided in accomplishing this goal. I’m not sure where all I still need to work in order to be the best student I can be, but I know that if I had more time in my life, I’d be doing a whole lot better (but wouldn’t we all?)! Honestly, the most helpful parts of the course were the discussions (as explained earlier) and having the simple quizzes. I like the fact that the quizzes weren’t difficult and merely were obvious key points that should have been seen if read (though some of the points I didn’t notice). The discussions really allowed for a greater understanding of the important parts of the readings (such as the author’s intentions, character analysis, and understanding the time in which the stories were written). In the Eyre Affair, literature is a very highly valued piece of work. Whether it’s time travel, vampires, or crazy inventions, the world within the novel is definitely extraordinary. The characters within the book do note on the bizarre nature and mysteries of their world; however, these crazy things are still within their social norms. When the evil Acheron Hades is first introduced, the fact that he has supernatural abilities (such as his hearing and cannot be killed) is definitely marked as amazing and far-fetched. But when it is discovered that these abilities are all real, it is relatively easily accepted by those after him. This is because crazy things are normal in this world! With that said, I think it would be very easy for a person in the world of The Eyre Affair to view these crazy abilities as talents – whether they are labeled “good” or “bad” talents are irrelevant. They are still talents. Imagine a world in which you have the ability to crush metal objects with your mind! You go from crushing cans to crushing incoming bullets to eventually crushing cars and planes. Regardless of if this talent is being used for good or evil, that is still extremely impressive! I believe that is the mindset that the characters of The Eyre Affair have in regards to these talents that create such monstrous acts. Once one is able to overcome the shock and disbelief of a talent, then it is able to be appreciated. When Thursday notes that Hades is very impressive, I think the fact that he is doing bad things stumps people. I do not believe that Thursday is condoning these actions by paying Hades a compliment. I believe that since the evil within Hades is normal to her, she overlooks that fact and strictly bases her comment on the talents in which he posses. Monster and demonstrate both have the same root word: “mon”. Mon means “one” and is derived from the Greek word “mons” which means alone. To demonstrate is to show, exhibit, explain, or make evident whereas a monster is anything unnatural, ugly, deformed, wicked, or cruel (as defined by morewords.com). Personally, I have a hard time relating the root word “mon” to monster – I can see that monsters tend to be alone, but that’s as far as I can make the connection. I don’t even see how “one” relates to “demonstrate”, so I believe that this point is as coincidental as “demon” being within “demonstrate”. However, I can see how monsters reveal something. In Jasper Fforde’s novel The Eyre Affair, the monsters (other than the werewolves and vampires of course) portrayed are human beings with talents and smarts that are used for evil – or monstrous – acts. I am a firm believer Mark Twain’s saying, “Actions speak louder than words…”. When one acts as a monster, they are demonstrating the fact that they are monsters. When one acts in a negative manner, it typically is due to a suppressed feeling or experience. Because of these connections, I definitely believe that monsters reveal something – whether they are revealing a traumatic childhood that shaped them into who they are today or a parallel to how their society behaves and values. However, doesn’t everyone and everything reveal something once you dig deep enough? In Mary Shelly’s “Frankenstein”, there is a strong emphasis on nature and the effects nature has on those who notice it. Shelly uses nature as a tool to set the mood of the scene as well as to change the mood of the characters. For example, in the beginning of chapter 2, the scene is set as a raining morning with “thick mists” that hid the mountains. Victor is affected by this weather; it made him feel “unusually melancholy”, “miserable”, and he even states, “The rain depressed me”. Shelly really emphasized that the negative weather truly impacts the characters in the novel. The environmental nature definitely effects human feelings, but does it effect human nature? In Seattle, Washington (where my parents live), it tends to rain quite a lot in the mornings. This rain has been thought to be related to the high depression rank (6th place in America), suicide rank (27th place), crime rank (25th rank), and even divorce rank (24th place). They experience an average of about 200 cloudy days per year! However, SouthUniversity.edu found that as weather warms up, crime rates sky rocket! The reason is thought to be because of the increased number of interactions people have during the warmer months in the year. Based on the information above, I would most certainly agree that the environmental nature changes human nature. Although, I suppose one could argue that the change in whether just provides more opportunities for different actions. I have a hard time labeling Dorian as either a villain or a victim because I can easily argue both sides (but I cannot easily form a consensus). Of course Dorian is a villain! He has killed many people, was to blame for at least 2 suicides, and clearly felt as if he was a villain himself. Why do I believe Dorian viewed himself as a villain? Well, I believe he is filled with a guilty conscience. Dorian feels guilty when a man was accidentally killed in his presence (I am referring to the incident when James Vane died during the rabbit hunting). Dorian also seems to be trying to make amends for his wrong-doings by not corrupting the inn-keeper’s daughter, suggesting to cover funeral costs, and even when he tries to destroy the painting (in my opinion, he was definitely trying to get rid of that evil – I find this to be especially true after Dorian tells Lord Henry to not give the yellow book to others). I also think that Dorian is a victim though. In class, it was argued that just because someone is presented with an evil (such as the book or even Lord Henry’s bad influence), they do not have to accept. Someone even suggested that Dorian must have already had evil within him that was only intensified when offered to do bad things. However, everyone has some bit of good and some bit of bad within them. The way that you are raised will definitely impact the decisions – whether they be good or bad – a person makes. It’s the whole nature vs. nurture controversy. Maybe it is true that Dorian was born evil, but he was malleable and was quick to mirror the personalities of those around him. I think that if he was surrounded by good and nurtured by good, Dorian would not have become the monster he did. I believe that Dorian is a victim of bad nurturing and I have a hard time holding that against him considering he was raised by the man who got his father killed which resulted in his mother’s suicide … of course Dorian was in turn nurtured poorly! I’m not denying that Dorian is in fact a villain, but there is just no way that he isn’t a victim too. It is interesting how every single person has their own perception of reality. Two individuals can look at the same piece of art and come up with totally different meanings. 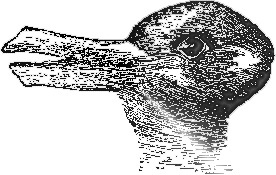 For example, when asked what the photo below is a picture of, one person may see only a rabbit while others may see a duck. The same is true when looking at a glass half-filled with water: you can either view it as half full or half empty. This is because everyone has a different background. Our backgrounds are what shape our perception. The perception of our surroundings is a mirror into the observer’s background. Dorian Gray is a “pure” character. He is described to have “extraordinary personal beauty” and thought to be “brainless”. He is naïve and has yet to be corrupted by society. Since he has yet to be molded (in my opinion), he will be easily impacted by other’s actions. For example, when Basil Hallward spending time with Dorian (which is every single day), Dorian continues to have his innocence and pure nature. However, when Lord Henry speaks to Dorian and spends time with him, it is very clear to the reader that Dorian is slowly veering away from this naivety. These interactions show the true nature of the characters spending time with Dorian. For example, Basil is not viewed as corrupt since, if he were corrupt, interactions with Dorian would in turn make Dorian corrupt. Conversely, Lord Henry is corrupt since when he interacts with Dorian, Dorian becomes more and more corrupt. I believe that the character’s true self is displayed (or mirrored) when you consider Dorian’s personality changes as a result of interacting with the character in question.